Over the last several days, I have gotten some very positive feedback on various aspects of this little corner of the internet. 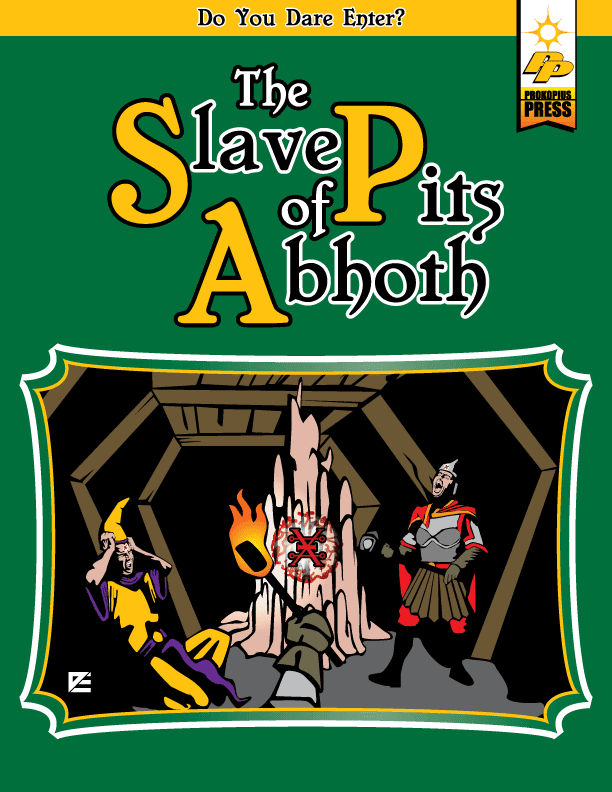 I definitely need to take a moment to thank every one who took the time to take a look at The Slave Pits of Abhoth and was kind enough to comment either here or elsewhere. I have been humbled by some of these reactions — and the people who made them. You have all been very kind indeed. I hope that as folks take a closer look and actually get to use it that my efforts will live up to that initial reaction. I also hope that folks will be kind enough to let me know what doesn’t work. I also need to take the time to thank Conrad Kinch, who was kind enough to nominate me for a Leibster Award, which is (in essence) a kind of chain letter of appreciation. I don’t normally pass any kind of chain letter along, and if I do what is asked (nominate five other bloggers who have less than 200 followers) eventually every one who does a blog with less than 200 followers will be a recipient. However, Conrad is one of those lucky few who has the time and resources to play miniature war-games on a regular basis (and focuses on one of my particular favorite periods — the Peninsular War between the British and the French) and hasn’t played D&D since sometime last century. Still, he takes the time to read my scribblings and thinks enough of them that they made his short list of things to call attention to. For that I must thank him and return the favor by pointing out that his scribblings (especially for those who, like me, yearn to be a miniature war gamer) are well worth the effort. In response to all of this praise (deserved or not), my focus turns to all of the things my various rambles have begun but never finished. Thus, at least in the near future, my production on line will slow a little while I try and figure out ways to actually fulfill some of that unfulfilled promise. Today is the feast of St. Clement of Rome. 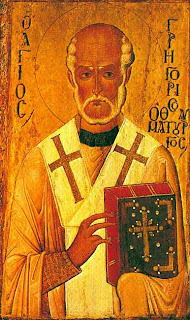 According to the list of bishops given to us by both St. Irenaeus and St. Hegesippus, Clement was the third bishop of Rome. He became a Christian through Sts. Barnabas and Peter. Under the reign of Emperor Trajan, St. Clement was first sentenced to hard labor (where he found and ministered to many Christians) and then drowned by having an anchor tied around his neck about the year A.D. 100. His legacy includes two Epistles written to the Corinthians. According St. Dionysius of Corinth, these letters were publicly read on Sundays in the church. Intriguingly, this means that these two Epistles were part of the discussion in the early Church as to what should be included in the New Testament canon. In my own experience, I have found that many do not realize that the NT as we know it was not formally recognized until the 4th century. Indeed, the earliest NT writings first appeared more than two decades after the crucifixion of Christ. They had to contain the Apostolic kerygma — Christ crucified and risen. They had to be written by that generation that witnessed Christ. Clement, being the third bishop of Rome was too far away from the Apostles to make the cut. Let us consider that wonderful sign [of the resurrection] which takes place in Eastern lands, that is, in Arabia and the countries round about. There is a certain bird which is called a phœnix. This is the only one of its kind, and lives five hundred years. And when the time of its dissolution draws near that it must die, it builds itself a nest of frankincense, and myrrh, and other spices, into which, when the time is fulfilled, it enters and dies. But as the flesh decays a certain kind of worm is produced, which, being nourished by the juices of the dead bird, brings forth feathers. Then, when it has acquired strength, it takes up that nest in which are the bones of its parent, and bearing these it passes from the land of Arabia into Egypt, to the city called Heliopolis. And, in open day, flying in the sight of all men, it places them on the altar of the sun, and having done this, hastens back to its former abode. The priests then inspect the registers of the dates, and find that it has returned exactly as the five hundredth year was completed. First, what if a the phoenix were an insect rather than a bird? This would explain the 500 year life cycle (an exaggeration of the 7-year cycle of the cicada), the worm-like larval stage (found in all kinds of insects) and (though Clement does not mention it) even the mythical fire of the phoenix (there are several insects that produce nasty chemical cocktails for self-defense). The “bones” in question could very well be the shedding of the outer shell as the phoenix emerges into its adult state. Second, the adventure in question could very well be something of a competition or race. The value of the phoenix bones would have to be very high (are they a key component in the spell Raise Dead?). Various factions would hire and equip expeditions into the ancient (and monster infested) city to recover these bones. The party could very well be one of these expeditions. Extra-party rivalry, intrigue and conflict would be all part of the fun. Are there any agreed-to rules as to how these expeditions are to be conducted or is it a free-for-all? If there are rules, what are the penalties for cheating? What is the procedure for proving that someone did or did not cheat? This, of course, is a beautiful set-up for a campaign. There is a built-in cultural reason that there are adventurers and that there is a megadungeon. There is also the added bonus of a built in time-frame in which a party needs to “level up” enough to be a contender in the adventure of several life-times. On this day one year from now, the competition begins. Will you and your party be ready? I pray that everyone had a blessed Thanksgiving Day. 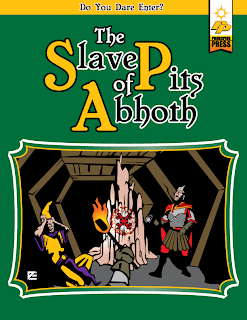 I managed to finish a rough draft of The Slave Pits of Abhoth. This means that I have gone through it, spell checked it and edited it myself. Thus, there are still going to be errors throughout. Since I have never had more ambition about this project than to do what I have — produce something that I can share with a community that has been very kind to me and as a way to say, “Thank you” — I have no real intention or means to get this thing more seriously edited. However, I do understand that with the technology we have available today that this could be made available in other formats. As such, I would like to make this post an open thread for folks to comment, point out typos, technical problems, errata, criticisms, etc. If there is a real interest, I certainly can explore further other options. In the meantime, (based upon feedback), I have decided to try Google Drive as a means for people to take a look at this. There are two links. The first is a normal layout one might expect from a .pdf. The second is saved as spreads so that folks can get a feel for how I originally envisioned this project to look. The first link is here. The second is here. Enjoy and please let me know what you think. And again, thank you. But where shall I rank the great Gregory, and the words uttered by him? Shall we not place among Apostles and Prophets a man who walked by the same Spirit as they; who never through all his days diverged from the footprints of the saints; who maintained, as long as he lived, the exact principles of evangelical citizenship? I am sure that we shall do the truth a wrong if we refuse to number that soul with the people of God, shining as it did like a beacon in the Church of God; for by the fellow-working of the Spirit the power which he had over demons was tremendous, and so gifted was he with the grace of the word “for obedience to the faith among…the nations,” that, although only seventeen Christians were handed over to him, he brought the whole people alike in town and country through knowledge to God. He too by Christ’s mighty name commanded even rivers to change their course, and caused a lake, which afforded a ground of quarrel to some covetous brethren, to dry up. Moreover his predictions of things to come were such as in no wise to fall short of those of the great prophets. To recount all his wonderful works in detail would be too long a task. By the superabundance of gifts, wrought in him by the Spirit in all power and in signs and in marvels, he was styled a second Moses by the very enemies of the Church. Thus in all that he through grace accomplished, alike by word and deed, a light seemed ever to be shining, token of the heavenly power from the unseen which followed him. To this day he is a great object of admiration to the people of his own neighborhood, and his memory, established in the churches ever fresh and green, is not dulled by length of time. Thus not a practice, not a word, not a mystic rite has been added to the Church besides what he bequeathed to it. Hence truly on account of the antiquity of their institution many of their ceremonies appear to be defective. For his successors in the administration of the Churches could not endure to accept any subsequent discovery in addition to what had had his sanction. Now one of the institutions of Gregory is the very form of the doxology to which objection is now made, preserved by the Church on the authority of his tradition; a statement which may be verified without much trouble by any one who likes to make a short journey. I would like to point out that St. Gregory’s witness, though powerful enough to the local Christians that they had refused to change anything in their liturgical life for well over a century, their practices were different from other local Churches. Note also that St. Basil had no real issue with this reality (as long as the dogmatic core of what was being taught and worshipped remained consistent). If you would indulge me, I would make the case that the Church of Neocaesaria is a bit like that segment of our hobby that plays OD&D. I would argue also that there are certain principles found in OD&D that can be found in later iterations of the game that remain consistent despite all the rule changes and development of the hobby, just as St. Basil found himself on the same dogmatic foundation as St. Gregory, despite the differences in form. When 4th edition came out, there was a lot of discussion about what D&D is, because the form had so radically changed that there was a question as to whether or not the principles that had allowed all of us to say, “I play D&D” (regardless of what ruleset we used) still existed. Although there had already been a move toward older styles due to the soul searching that followed Gygax’s death, I firmly believe that the existence of 4e accelerated the depth and the breadth of this exploration. The fourth century in Christian history had a very similar pattern. There were a number of theologians deeply influenced by philosophy that started doing and saying things that were far enough away from what had come before, that the Church had to ask the question “What is Christianity?” Their answer is recorded in the dogmatic statements of the Ecumenical Councils. What is fascinating about this history, however, is that those very same councils would use words and forms that were never used by Christians before them in order to defend what had come before. In other words, they borrowed things from their contemporary milieu, re-applied what had come before into this new-milieu, and came out stronger. We live in a new milieu. It is no longer the 1970s. Our cultural and technological landscape is radically different. What Robert is suggesting is that we take the principles of our hobby as they existed in the 1970s and re-apply them to our current reality. What we might end up with may very well look different from OD&D, but our hobby today is going through a golden age because of this process of re-applying what we learned from the hobby as it was in the 1970s. For example, player freedom, agency and creativity are core principles that I insist upon. In my own experience, the best way that these get expressed is within the context of an abstract combat system. My recent musings on some of the shortcomings of this abstraction, however, resulted in a few folks reminiscing about how glad they are that they no longer play that way. Indeed, Robert himself prefers a far more concrete form of combat simulation (but acknowledges that the trade-off is far more time spent in actual simulation). This is a pattern found in the 1970s, when several folks moved away from the D&D abstraction towards a more realistic model — because that realism was a core principle that they found important enough that they changed the way they played the game. The beauty of our current situation is that we have all of the history to go back to and see how it was done before and what resulted from certain choices in game-style and rule-set. We, because of our milieu, now have the freedom to go back and tweak these choices and explore how other choices impact the way the hobby is done. And we are stronger for it. I have been ill this week, therefore I have done a lot more TV watching than I normally do. Fortunately, in these days of streaming video, it means I can be a lot more selective about what I watch. One of the more surprising discoveries I have made this week is CW’s Arrow. 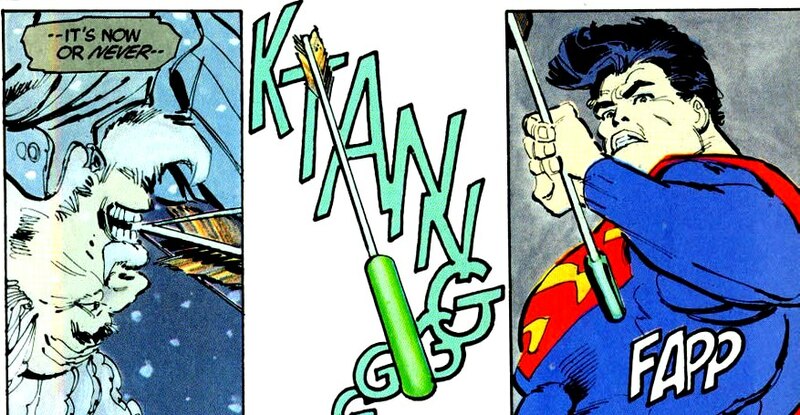 The sheer tenacity of the aged, one-armed Oliver Queen taking on Superman (and winning) in Frank Miller’s Dark Knight warms my heart. 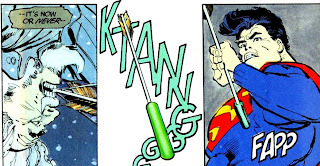 One of the reasons I tend to be a DC guy is that they play with the archetypal struggle of humanity vs. the superhuman. This is exemplified not only by the image above, but by the fact that Batman has a piece of green kryptonite in the Bat Cave just in case. It is fine when the god-like superheroes of the DC universe serve humanity, but the moment they turn on humanity (either out of selfishness or allegiance to a different cause), guys like Batman and Green Arrow are ready and willing to take them on in defense of us regular joes. I love that. From my own Christian POV, Batman and Green Arrow are akin to prophets — they are ever-vigilant against idol-worship (which is what superheroes would be doing if they stopped serving humanity — they'd worship themselves and their power rather than the God who created them) and they remind us of the fallenness of the world in which we live. This all brings me back to CW’s Arrow, which is a TV adaptation of DCs Green Arrow, and it is a surprisingly good one. Not having paid much attention to comics in well over a decade, I don’t know how well the series meshes with current canon, but I really don’t much care. It is a refreshing re-telling of the Green Arrow story that gives enough nods to the mythos that I am very much satisfied with the effort thus far. One of things that I am finding very intriguing is the honesty with which it deals with the consequences of being a vigilante. Unlike the classic Batman, this version of Oliver Queen has no qualms about killing people. Although he has done the calculations and figured that it is worth the price, there is definitely a toll that is being paid for all this darkness. While I completely understand why he has made the choices he has, I don’t agree with his choices. And yet, I care enough about him that I continue to watch. Indeed, for my buck, this is one of the best TV adaptations of any comic book superhero I have ever seen. So, if you haven’t already, check it out. In a melee the attacker strikes a blow or "takes a swing." Melee is the most exciting part of the game, but it must be imagined as if it were occuring in slow motion so that the effect of each blow can be worked out. Recently there have been a couple of attempts (Brenden at Untimately and Talysman at 9 and 30 Kingdoms) at reversing this trend by abstracting missile combat. As much as I like both of these (especially Brenden’s), they both break down once thrown weapons enter the picture (as Brenden himself acknowledges). Once the party is engaged in melee, arrows can not be fired into the fight because of the probability of hitting friendly characters. If one follows Holmes on this score, than melee combat is clearly differentiated from missile combat — they happen in different phases of the game and can therefore be handled differently. Melee can be abstract while missile combat represents individual shots. Movement … is in segments of approximately ten minutes. Thus it takes ten minutes to move about two moves — 120 feet for a fully armored character. Two moves constitute a turn, except in flight/pursuit situations where the moves/turn will be doubled. Melee is fast and furious. There are ten rounds of combat per turn. There are ten "rounds" of combat per turn. Each round is ten seconds, so a combat turn is shorter than a regular turn, but results in at least as much muscular fatigue. Movement (if any) is usually at a sprint; an unarmored man can move 20 feet per melee round, a fully armored man only 10 feet. Note that if one ignores the fact that Holmes has shortened the combat round from one minute to 10 seconds, his combat movement is approximately 1/10 that of normal movement (for a more detailed examination of movement in Holmes, see my post here). In other words, rather than having a full move every round, a character or monster still has a full move over the course of a turn. The upside of this understanding of movement is that in a typical encounter, the process of closing into melee (and thus ending the missile portion of combat) will usually take a number of rounds. Thus, the process of getting into melee is full of interesting tactical choices. For those of you who have grown up with the notion that their character can fire into a melee, the subsystems are actually not as incompatible as one might expect. As Holmes suggests, firing into melee is fraught with danger — there is a very real possibility of friendly fire (my take on how to do this with Holmes is here and here). Thus, rather than letting loose as many arrows as possible into the fight, an archer would most likely be waiting until there is a safe opening through which to fire. Thus, in the abstraction of melee combat, someone who is firing into that melee is going to only have one clear shot every minute or so — which translates into one missile per round. Today is an intriguing local commemoration within the Georgian Orthodox Church — the Martyrdom of St. George the Great Martyr and Trophy-Bearer. The country of Georgia has a very special relationship with St. George, who is normally celebrated on the day of his death: April 23. This relationship begins with St. Nino Equal-to-the-Apostles and Enlightener of Georgia (a woman, by the way). She was a relative of St. George and was intimately familiar with his story. 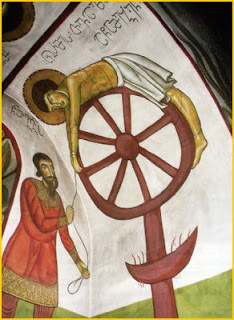 She set aside today as a special commemoration of St. George, remembering his torture on the wheel. Historically, a victim of the wheel was tied across the spokes and a hammer was used on the limbs of the victim in-between the spokes. This made it easier to break bones. Victims would be left exposed and would die of dehydration, shock or a combination of the two. Through St. Nino, St. George became a patron saint for the whole nation. A patron saint is a saint with whom a nation, organization, family or individual has a special relationship in which the saint is seen as a special protector and whom prayer is especially dedicated to. 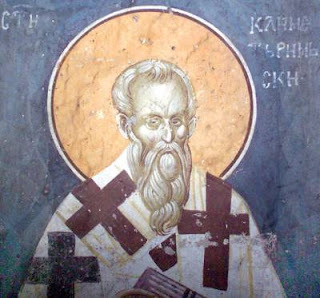 As a result of Georigia’s relationship with St. George there are churches and chapels dedicated to him all over the country (especially in villages). Almost every day of the year, there is some sort of dedication to St. George related to the building of a church or chapel, or a miraculous icon. Local festivals can be based upon events in the life of the saint (for some ideas, you can check out this post). Items from the saint’s life could have special meaning and thus require extra effort. 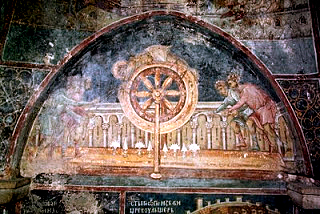 For example, in a fantasy version of Georgia, it might be seen as anathema to use any wheel without first getting it blessed by the local priest. These same items could also become symbols of local guilds, organizations or individuals. In other words, with very little effort, an entire region of a campaign world can come alive and have a depth of character simply by telling the story of a saint. For example, in my pre-blogging days, one of my Gamer ADD projects was a pseudo-Christian campaign world to take advantage of several Goodman Games modules I own. The small region that was to be the focus of the campaign had been invaded by an evil army and the local rulers (four of them) were asked to surrender. Part of this meant denouncing Christ. They refused and where turned to stone. Miracles started happening in the vicinity and allowed the locals to push the invaders out of their little valley. Colloquially they are called The Four Saints or simply The Four. They still stand petrified where they were originally turned to stone (though they have been known to change over time). One of the ways this patronage plays out in the local culture is that it is considered bad luck to sell anything in anything other than a factor of four. Thus, livestock is sold by the hoof rather that the head. This sort of thing doesn’t have a major impact on the mechanics of the game, but it does give the players a chance to immerse themselves into a campaign world with something simple and relatable. Today, I would normally be inclined to wax poetic about St. Raphael of Brooklyn (since he is a recent and American Saint); however, since he is celebrated on the first Saturday of November, I did so last year. Having re-read that post in preparation for this one, I would add to it my own recent musings about WH40K and the ability to include the wandering Christian in any RPG setting. Rather, I will write about another feast celebrated today: the Martyrs Arkepsimas, Joseph and Aethalas of Persia. During the 4th century, Christianity was flowering within the Persian Empire. The Church was building churches and appointing clergy even in the royal cities of Seleucia and Ctesiphon (both in modern day Iraq). Both the Magi of the native Zoroastrianism and the local Jews grew envious of this success. Therefore, they accused the bishop of these cities (St. Symeon) of espionage. This charge stuck because Christianity had become the state religion of Persia's great rival — the Roman Empire. Thus began a great persecution of Christians within the Persian Empire under Sapor II. Sts. Arkepsimas, Joseph and Aethalas were all arrested during this time. 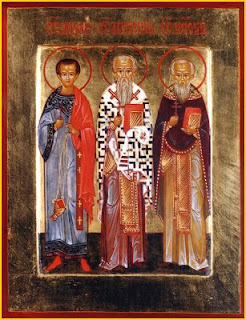 Arkepsimas was Bishop of Naesson, Joseph was a presbyter and Aethalas was a deacon. They were taken to Arbela where they were put on trial by the Zoroastrian Magi Ardarkh. When they refused to denounce Christ, they were thrown in prison where they suffered for three years. At this point, the emperor himself came to worship at the temple in Arbela and demanded to see the three prisoners. When the three confessed their faith in Christ, Arkepsimas was beheaded and Joseph and Aethalas were stoned. Interestingly, guards were set up so as to prevent the recovery of the bodies. Christians managed to recover Dn. Aethalas and secretly buried his body. At his grave, a tree began to grow bearing fruit with healing properties. For me, the beginning of this story puts an interesting twist on the classic fantasy trope of Temple Street. Imagine, for a moment, rather than the classic RPG and S&S pseudo-pagan temples (such as those from the Greyhawk pantheon like Pholtus, Celestian, Fharlanghn, Boccob, etc), a street with a Zoroastrian Temple, a Jewish Synagogue and a Christian Church. For me, this is a much more intriguing set-up than the normal trope. In addition, this story suggests a spin on the traditional Rescue-the-Princess adventure trope. Imagine, for a moment, an urban campaign where one of the party’s primary functions is the recovery of bodies. This need not even be in an overtly Christian context. One could justify a whole campaign based on the idea that there are necromantic forces that have power over the bodies of those that are not properly buried. Thus, the recovery of a body means one less undead the city guard have to deal with. In addition, each fruit will have 1d4-1 seeds. These can be used to plant a new Deacon’s Tree or (more commonly) as a one-use +1 bonus to any die roll (after which the seed is destroyed). Earlier this week, I posted an update on my version of the Slave Pits of the Undercity. The main purpose of that post (besides putting pressure on myself to finish the project), was to ask the question of those who know better than I: what is the best, easiest and safest way to get people the .pdf who want it?